Flatten chicken breast, lay out prosciutto, asparagus and sundried tomatoes across each piece and roll them into cylinders. Place the chicken rolls into a medium zipper bag and seal it. Cook them sous vide by placing the bag in a water bath at 60°C for 1½ hours. Sauté brown rice in a pan over medium heat, and add in the wine, stirring continuously until liquid is absorbed. Add a ladleful of the vegetable stock to the rice. Keep stirring till stock is absorbed. Repeat until all the stock is used. Set aside the cooked rice. Roast the vegetables with butter. Prepare the parmesan crisp by placing grated parmesan on parchment paper and bake at 200°C for 2½ minutes. Finish the risotto with the parmesan crisp. 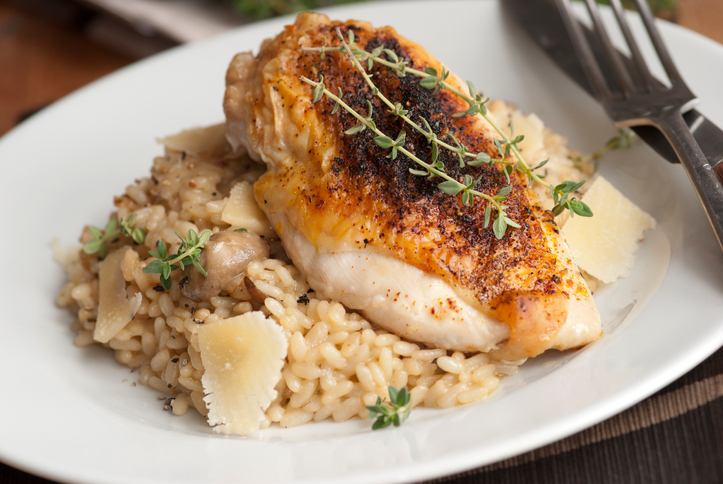 Plate the chicken rolls, risotto and roasted vegetables and finish with hot chicken jus.